Who (and what) is Olly M? We’re not allowed to say ‘The Oswestry Olympics’, even though we have found a notice that describes the Ho-Lympic-Gaymes which took place in Oswestry in 1834 - It’s true! But we are allowed to say ‘Olly M Pics Oswestry’. (I hope nobody at the IOC is reading this!) Luckily, we managed to find a charming Fox named Olly M who lives with Paul Marshall of Ballsports Community Coaching in Shropshire. Olly M willingly agreed to be our mascot! 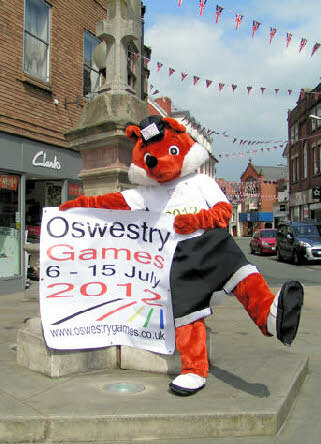 Pictured - Oswestry Games mascot ‘Olly M’ Pics a nice sunny day to fool about in Oswestry! 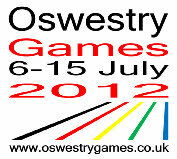 Here, you can discover what the Oswestry Games is all about, what you can see and what you can jon in. The Games is a ‘once-in-a-lifetime’ community event celebrating the Olympics coming to the UK. There are a huge number of clubs in the Oswestry area and many of them are collaborating in this week-long festival of sports and arts events that we call The Oswestry Games. You can see a full list of the events on the Events - Day-by-Day List. There are links on the buttons at the top of the page to the Games Newsletters, which we have published over the last 18 months. There will be one more Newsletter before the Games start on July 6th. The Latest News button is just that and the Blog has all of the archive news over the last year or so. You can find out about the Oslympic 10K and Games Medals by clicking the buttons above. Don’t forget to have a look at our Sponsors list, we’re very grateful to them! 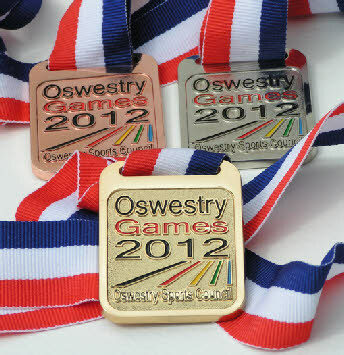 The Oswestry Games Programme is available now at the Leisure Centre, the Tourist Office at Mile End and the Library. The programme includes a foreword by David Moorcroft O.B.E. along with a complete listing of all events in the Games. Printed in full colour throughout and 64 pages long, it is our hope that it will be a useful directory of local sports clubs and societies. After a lot of thought we have decided to make a small charge for the programme which we will put towards the cost of printing. We will distribute programmes to each club (free) which can be sold for club funds.